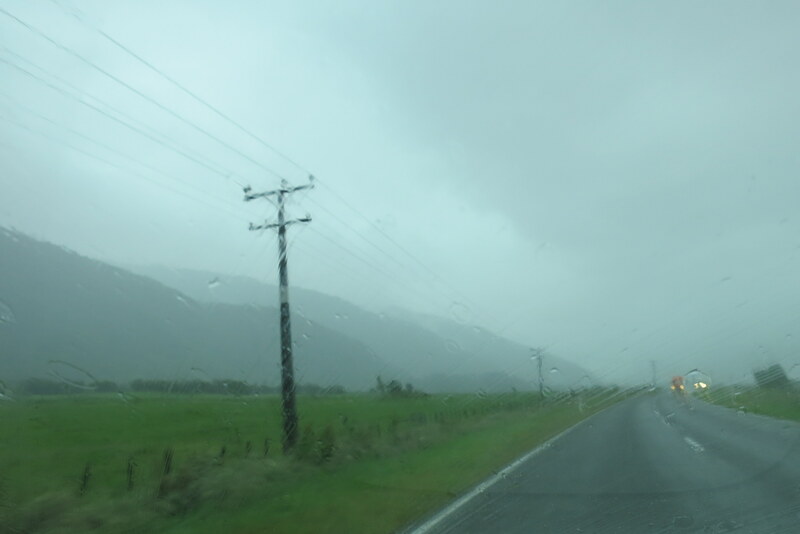 The west coast of New Zealand’s South Island is often called the “wet coast,” and it certainly rained enough while I was there to convince me that this is no casual nickname. The west coast is a narrow piece of land with the Pacific on one side and the mountains on the other, with one highway running the length of the island and just a few mountain passes crossing over to the calmer fields of the east coast. That’s a pretty isolated position when you think about it, as a lot of travelers discovered when the rains around New Year’s took out a section of bridge near Harihari, and they all had to scramble to go north or south in very roundabout ways. Happily, Liz and I made our way west and south before the heavy rains started, so we were able to see a little of the area. We drove through the mountains for most of the day, then stayed at a brightly decorated hostel in Greymouth. The next morning, we followed the hostel receptionist’s directions to the beach. Well, “beach.” It was a gray strip of land covered in small gray rocks, with a green-gray sea lapping up against it, under a blue-gray sky. You can’t accuse the city of false advertising. But it was actually a peaceful spot to spend an hour. We hunted for jade among the rocks, and found that the more we looked, the more green we found among the gray there. 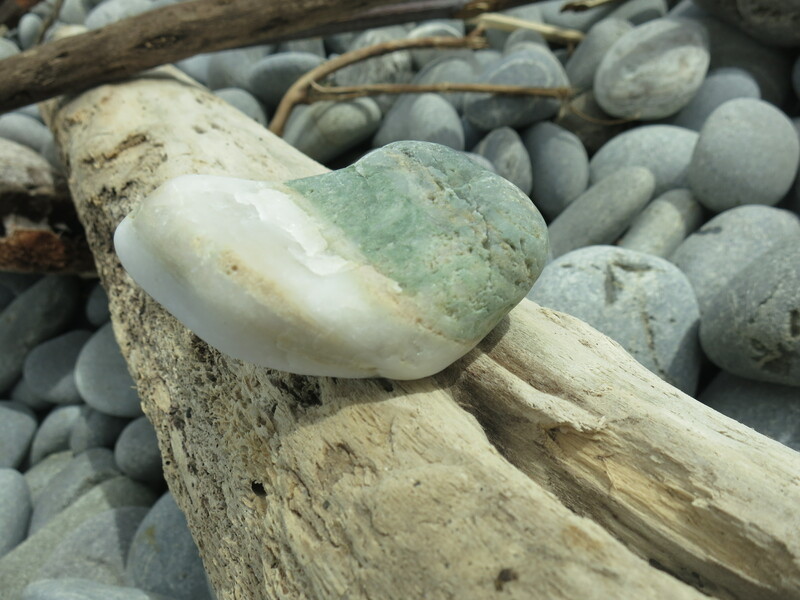 (We never found actual jade, but that is a common stone here, the “greenstone” as the Maori call it, and it’s found in a lot of necklaces and artwork.) 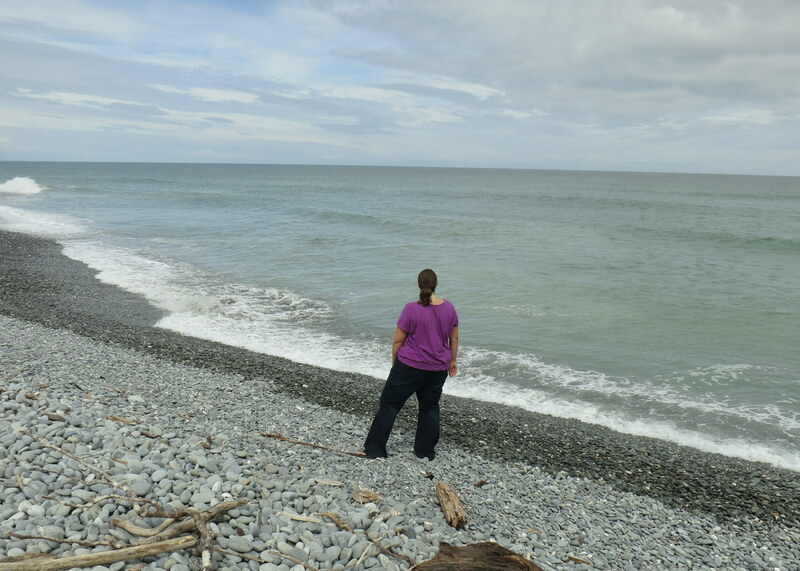 Also, every time a wave washed ashore, it made a wonderful rattling, wooshing sound as it retreated back to the sea. It was like turning a rainstick over, to the rhythms of the tides. 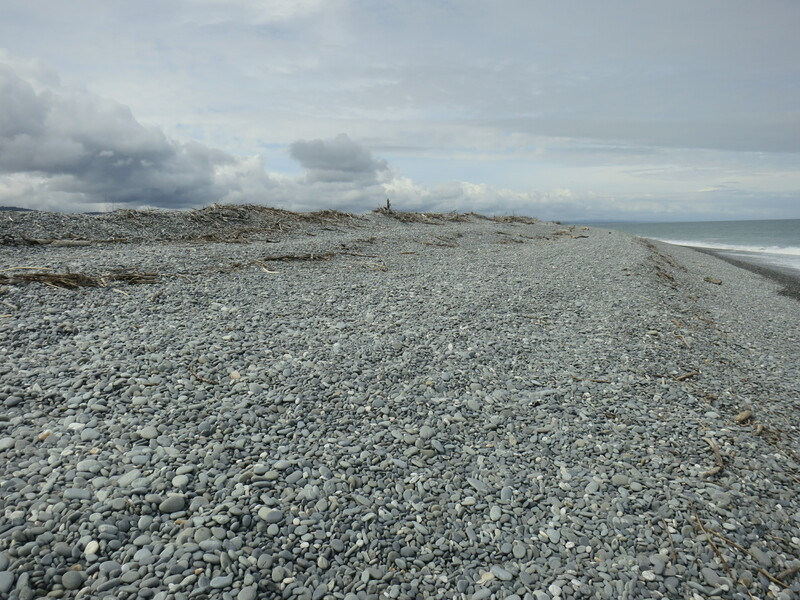 We drove to Hokitika, a charming town with a few tourist spots and a helpful iSite worker who booked our Fox Glacier tickets for the next day. 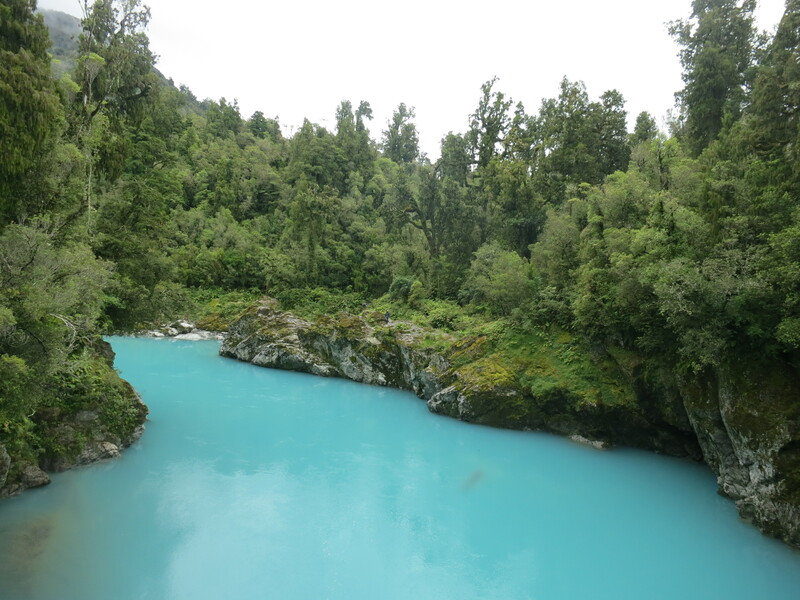 We took a picnic lunch out to Hokitika Gorge, and saw again the startling turquoise blue of Huka Falls (although there was no rushing water this time, so I’m not sure how that squares with the supposed reason for the color being lots of bubbles). 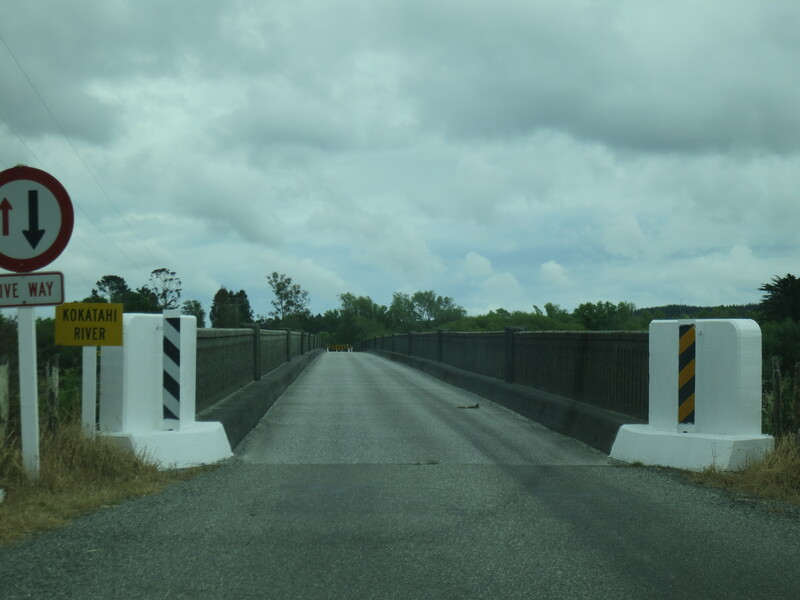 The walk from the carpark only takes ten minutes, through lush green forest, down to a swingbridge that everyone clung uneasily to as they made their way out to the center. We admired the views and then scrambled back to the car before the storm clouds overhead broke loose. Suddenly, a cow appeared to our right. She had got out of the field somehow, and was walking along, unconcerned, until she noticed our car. Then she became alarmed and walked right in front of the car. Liz gave the car horn a beep, and the cow started trotting, and then we noticed cows in the field to our left started trotting as well, apparently giving the rogue cow encouragement. She eventually moved over to the left enough that we could get by. A cow guarding the entrance to the gorge–what’s the usual entrance fee in that case? 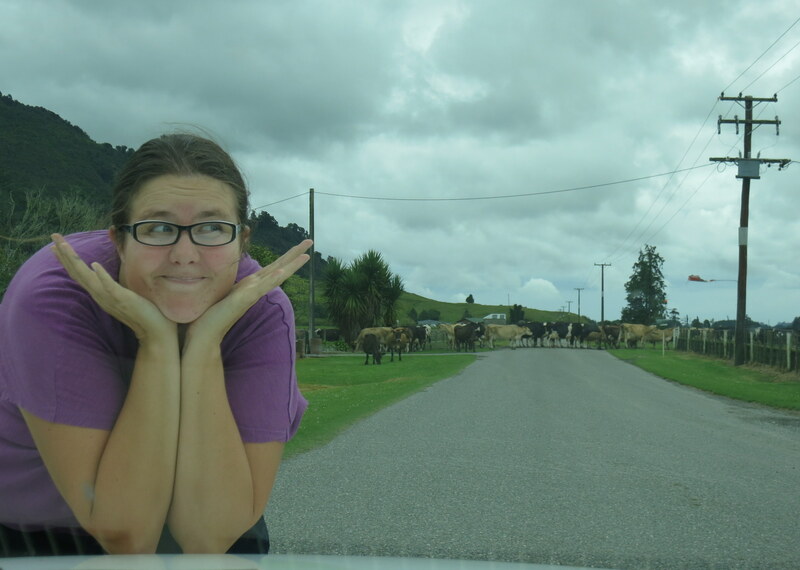 Cow crossing–what can ya do? On our way back to Highway 6, zipping down the relatively flat lanes of the Westland countryside, we had to stop for a good ten minutes. It was milking time, and the dairy farmers had opened up the gates on both sides of the road, and a stream of cows moved from the field over to the barn. One the farmers stood in work boots and watched, and the other sat in her ATV and kept a lookout for the few cows that strayed down the road. Rush hour on country roads is a lot like rush hour in the city in that way; nothing for it but to sit it out. Twenty kilometers later, the rain started in earnest, and it wouldn’t let up for days, in what the owner of the hostel I stayed in called one of the worst downpours he’d seen in years. Not that this stopped Liz and me from climbing a glacier in the middle of it. Stay tuned for that story next time! 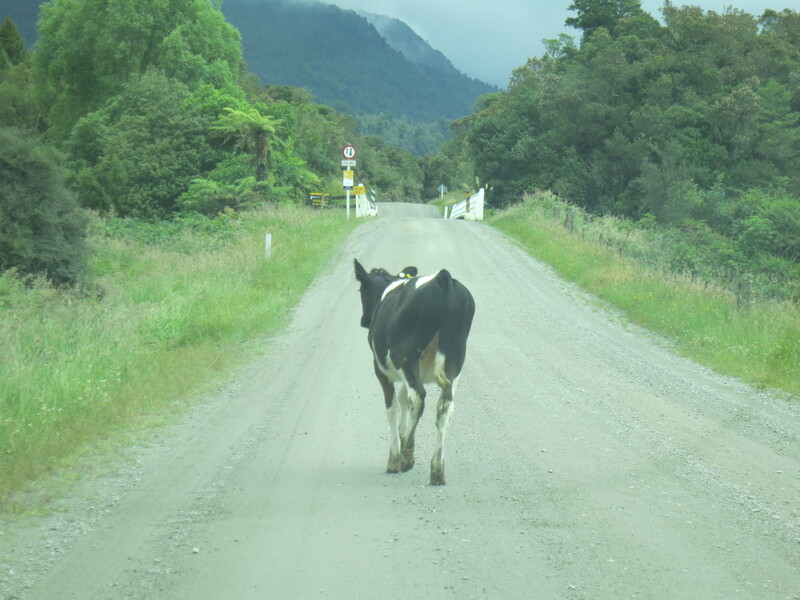 This entry was posted in New Zealand and tagged cow traffic jam, greenstone, Greymouth, guard cow, Hokitika Gorge, jade, New Zealand, West Coast, wet coast by lisafindley. Bookmark the permalink. 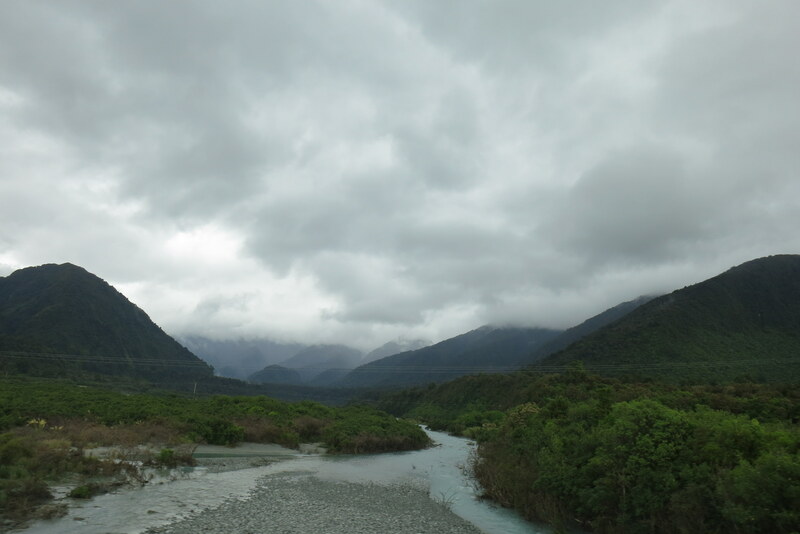 I’ve been through Hokitika several times now and didn’t realise they had such a beautifully colored river. Damnit! Next time, Theresa! You have to drive a good 30-40 minutes east of town to see it. Had we more time, we would’ve done the suggested circuit that takes you by the lake and some waterfalls there too.